Higher performance and lower maintenance with a VACUU•LAN® local vacuum network. 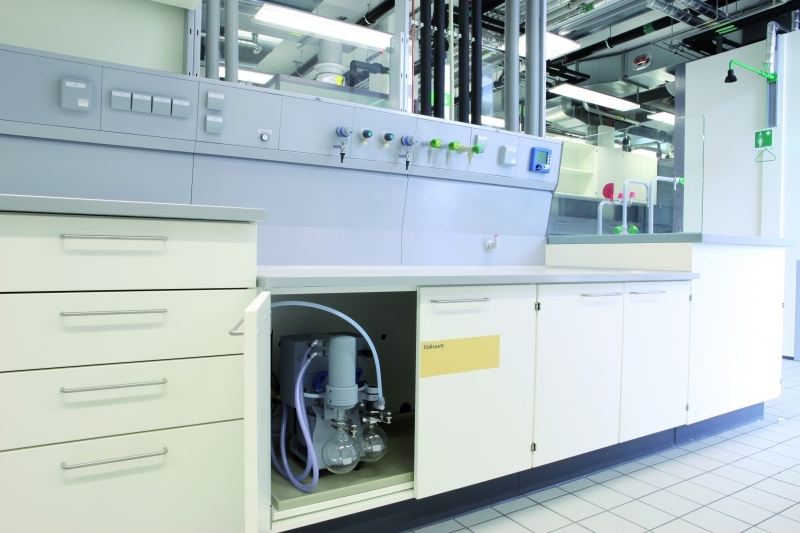 Research and teaching labs are resource-intensive with high maintenance requirements. VACUU•LAN® local vacuum networks provide both the performance scientists need and the low maintenance facilities managers appreciate. Local vacuum networks allow for individual pumps to be selected based on the performance requirements of the scientists, which allows networks to be designed for high flow or to supply deep vacuum levels. Specially designed vacuum fixtures with integrated check valves greatly reduce inter-lab cross-contamination risks and ensure vacuum stability. Lab-by-lab network installations provide total network installations, which makes multi-user vacuum systems possible for BSL laboratories. VACUUBRAND’s VACUU•LAN® network pumps have fluoropolymer and perfluoro-elastomer wetted materials that give them outstanding resistance to the corrosive chemicals used in labs. These chemical-resistant wetted materials and exacting design standards mean that VACUUBRAND diaphragm pumps have typical service intervals of 15,000 operating hours. VARIO® controlled pumps automatically adjust pumping speeds to system demands. When demand is not detected, the pump goes into a “sleep” state conserving energy and lowering maintenance intervals. Discover the benefits of reliable vacuum networks. VACUUBRAND has specialized in whisper-quiet, vacuum pumps for labs and OEM applications for over 50 years. We manufacture the most comprehensive range of vacuum pumps, gauges and controllers for rough and fine vacuum. We have earned a loyal worldwide following for our corrosion-resistant oil-free pumps, long service intervals, mercury-free vacuum gauges, development of solvent vapor-capture accessories and our VACUU•LAN® local vacuum networks.